Unless you’ve indulged in RPGs like Atelier Totori: The Adventurer of Arland and Hyperdimension Neptunia, you probably have no idea what Time and Eternity even is. I honestly didn’t know until I walked into the Atlus booth to see what NIS America had to offer at this year’s E3, but thankfully, I got a chance to get my hands on this not-so-classic role-playing title. The verdict? People who’ve been ignoring the admittedly niche offerings coming out of NIS may want to pay notice to the publisher’s latest import. What you’ll notice first about Time and Eternity is the art style. Instead of incorporating polygonal models to the game’s open world, the characters of this Imageepoch-developed project are completely hand drawn. The backgrounds that are explored are in the 3D, while each and every personality inhabiting the world is stuck in a 2D realm. It’s a bit jarring at first, but its creativity is just too great to ignore. Really, there’s nothing else that quite looks like it on the market. The combat is also distinctive. Battles are initiated after taking a few too many steps in the overworld, and while it at first looks to be a simple turn-based system, everything happens in real time. 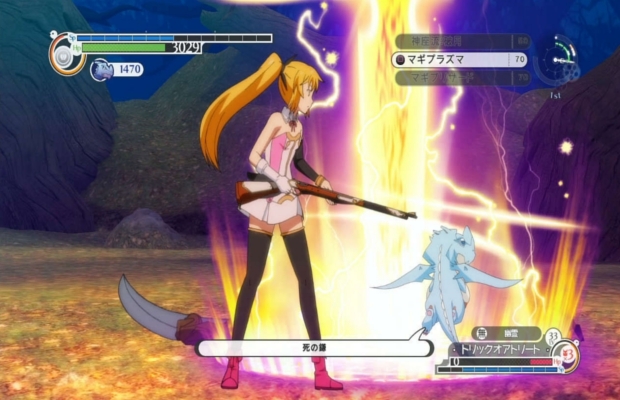 The player character, Toki, can both hang back and shoot at an enemy with her rifle or jump forward in order to mix it up on the inside. Both Toki and any monster she runs into can fire off a bit of offense whenever desired, but battles can’t be won without a mix of well-time defense. Quick dodge techniques supply the defensive player wonderful opportunities to get in close and dole out a significant amount of damage, so a nice blend of techniques is really the more effective way deal with battles. Unlike most games in this genre, you aren’t faced with more than one enemy at a time. Toki participates in one-on-one duels, and after that single enemy bites the dust, the camera swings to your next opponent. It allows each dangerous enemy, as well as every combat scenario, to feel more significant, and helps the active nature of the gameplay flow in a natural manner. It was difficult to get an idea of just how deep the actual game will be from the floor demo. I was told that a second character, Towa, will be a consistent element throughout the story. Her focus is more on close-quarters combat, and she somehow acts as Toki’s alter ego. A small, flying dragon character is also following Toki through her quest, and seems to play a significant role in the narrative. However, trying to parse the story beats of a JRPG on a busy showroom floor is something I’d rather avoid. Let’s just wait until the game actually hits store shelves. Thankfully, the release date isn’t too far off for Time and Eternity. NIS America will be bringing this unique venture to North America July 16 as a PlayStation 3 exclusive. It may not completely convince the world of the genre’s relevancy in the modern day, but it’s still a breath of fresh air worth keeping an eye on.